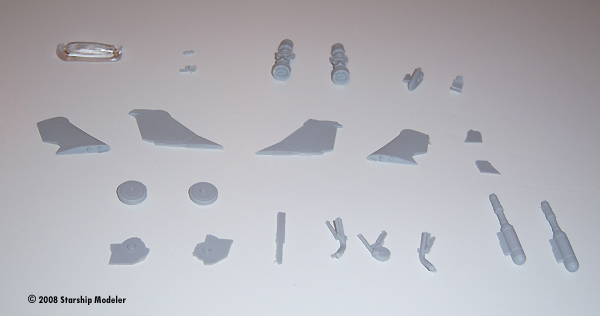 Parts: 25 resinm including clear canopy. Image: Underneath. You can see the pour stub in this view. Image: ... but fairly distortion-free. 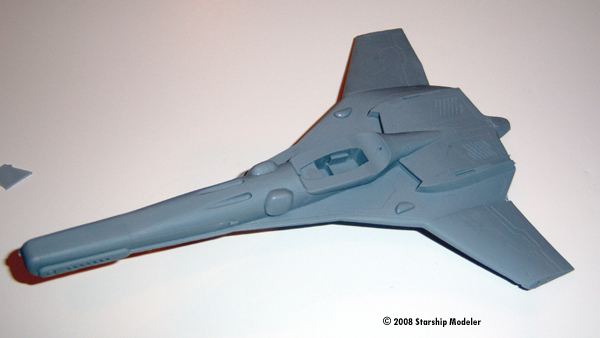 In 2007, Fantastic Plastic Models invited the model building public to design an original, futuristic starfighter that could be made into a 1/72 scale model. 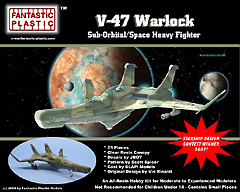 Of the almost 200 submissions received and voted upon by the masses, Vic Rinaldi 's V-47 Warlock design -- a dual-purpose (atmosphere and space) one-person fighter - was the clear favorite. This year, Fantastic Plastic commissioned a master pattern of the design and this kit is the result. Inside the standard, sturdy box are 25 resin pieces, an ALPS-printed waterslide decal sheet, and two pages of instructions. 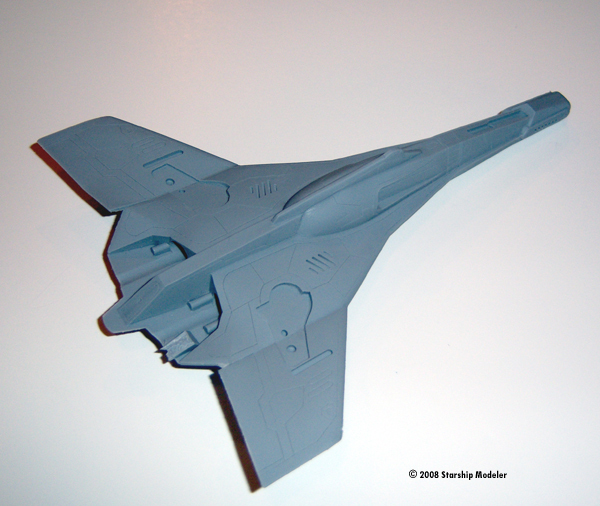 The resin includes one water-clear canopy, and the option to pose with landing gear down or retracted (though no base or stand is provided for the latter option). 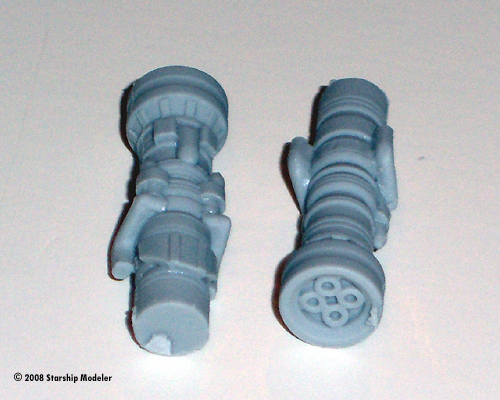 The resin pieces, patterned by Scott Spicer and cast by BLAP! 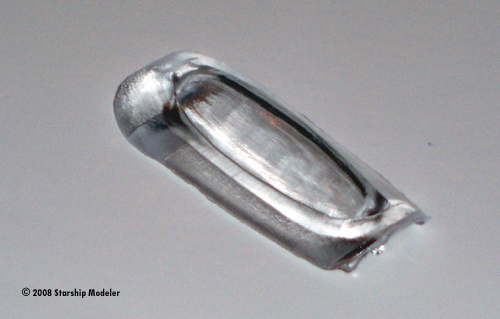 Models, are exquisitely rendered and superbly cast. And I don't use those adjectives lightly: both pattern maker and caster are amongst the best in the garage kit business. Mold seams, flash, pits --- all are negligible, though there are a few pour stubs that will have to be carefully trimmed away (the largest of these is on the main fuselage, where an engine should cover the spot later in assembly). Detail is crisply rendered, straight and symmetrical. I had to really look closely to find one or two scribed lines that did not quite meet up (and that's a trivial matter to correct). 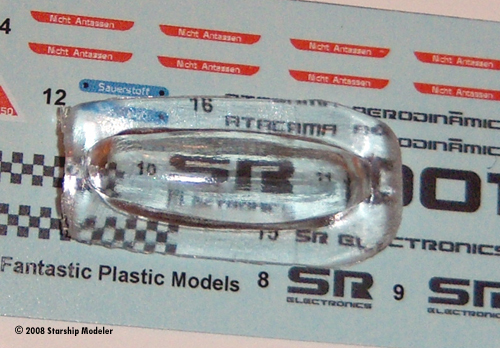 I prefer clear vacuformed plastic canopies - but this resin one is pretty good. 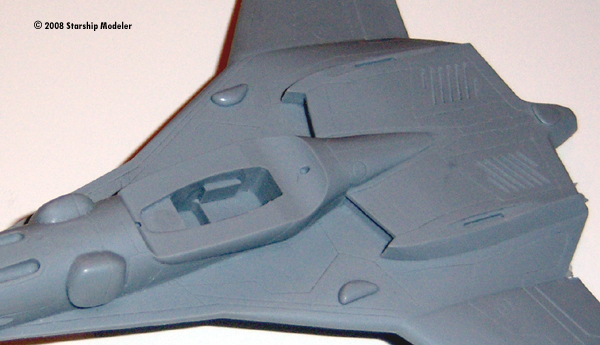 It is pretty thick, and as a result is not completely distortion-free, but you should be able to see any detailing you add to the cockpit with it in place. Any such detailing, by the way, will have to be scratchbuilt; aside from the seat, the whole “office” is pretty Spartan, without even decals for the consoles. Think of it as an opportunity to excel. Instructions are utilitarian, consisting of three pages of the usual warnings (DON'T SMOKE RESIN! - it's BAD for you! 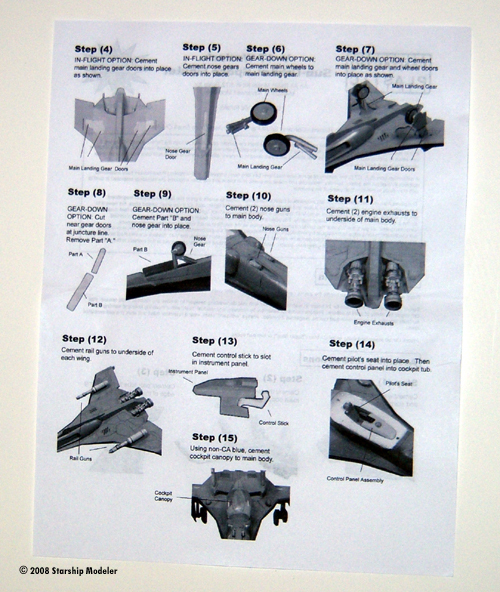 ), 15 illustrated assembly steps and a paint/marking guide. They are clear and concise. ALPS-printed waterslide decals, printed by JTGraphics, provide exterior markings for one ship. Taping parts together doesn't reveal any surprises. If you are ham-handed like me, you will need a smidge of filler around the various fins - but just a smidge. The model may be built with gear up or down. I'm not overly confident that the thin resin landing gear struts will hold the relatively heavy fuselage up for years without bowing, especially in the heat of Midwestern summers. Add to that the fact that the landing gear bays are improbably shallow and undetailed, and I think I'll opt for a gear-up display (though I'll have to source a pilot figure from elsewhere as none is provided). Painting and markings are left pretty much to the builder - since this is an original design, the sky is the limit. The markings on the decal sheet provide a mix of contemporary fonts and WW2-style German stencils. I'm not sure how much of them I will use - I'll have to come up with a marking scheme first. If you want a break from the ordinary, this kit is a good candidate. 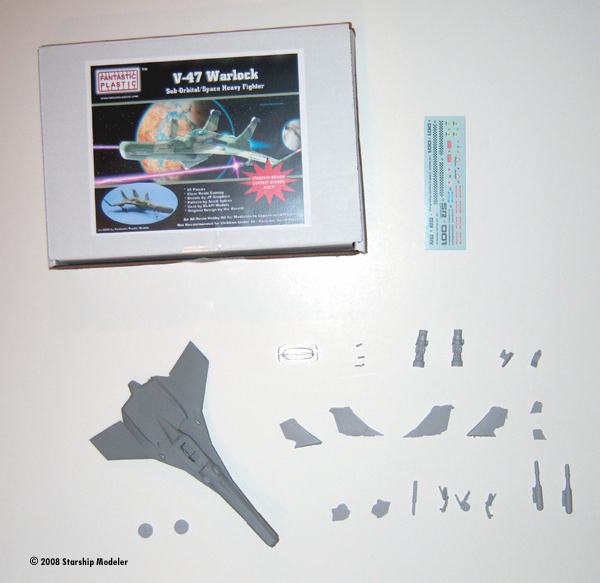 The low parts count, careful engineering and excellent casting make it project any modeler with a few kits under their built can tackle with confidence. And no matter how you build it, only one person in the world - Vic Rinaldi - can tell you you're wrong. The only downside I can see is the price - which is not at all unreasonable, given the low-volume production, hand-made patterns and hand-cast reproductions. This page copyright © 2008 Starship Modeler. First posted on 20 August 2008.